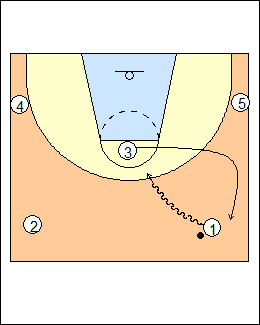 Spread the floor tied or with the lead late in a game, go into a four-corner set ("four to score") with a player at the foul line who is a great receiver, can put the ball on the floor, and is often the best athlete. He can come out to halfcourt if necessary. To avoid traps, never cross two attackers on the ball. Never put the ball on the floor unless there is a need or reason, make them come chase you. When the ball goes to the middle, both corner players go to the blocks, then back to the corners when the ball comes back out (shown). 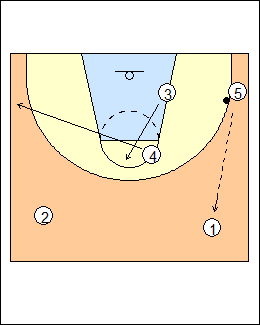 When the ball goes to a corner the high post drops to the block, the weakside corner player goes to the weakside block and eventually flashes to the ballside elbow, look for high-low action. Get back to original positions on a pass back out, move on the pass not the catch. 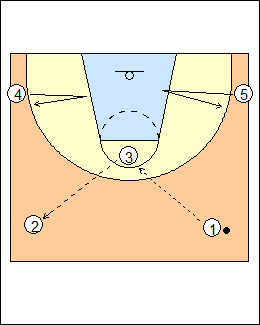 See Press breaks - halfcourt Park View High, Atkins, Zone offence - 2-1-2. 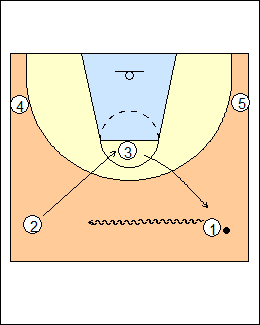 If one guard dribbles toward the other guard, the off guard cuts to the middle and the high post replaces the dribbler. Wootten doesn't emphasize crashing the offensive board on the last shot, he has seen too many over-the-back calls. 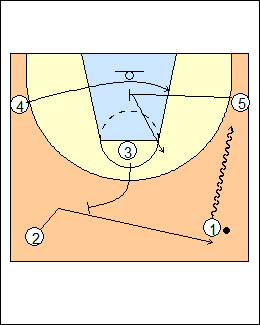 Ken Atkins - Four to score delay game - if 1 dribbles middle towards the lane, 3 cuts to the sideline then replaces 1. Hoop Tactics - Drive and kick spread game - essentially a three-man weave, 1 dribbles middle, passes to 2, circles to the ballside sideline (keep the middle open), then replaces 2, who drives middle and kicks to 3. 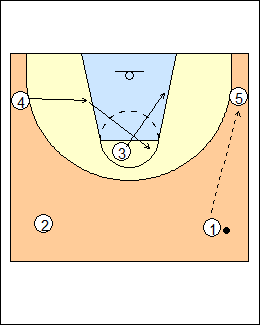 Atkins - if 1 dribbles up the sideline, 3 screens away for 2 who replaces 1, 5 cross-screens for 4, who goes low, 5 seals and comes back to the high post (if defenders switch the cross-screen, 4 cuts high, 5 seals back to the low post).